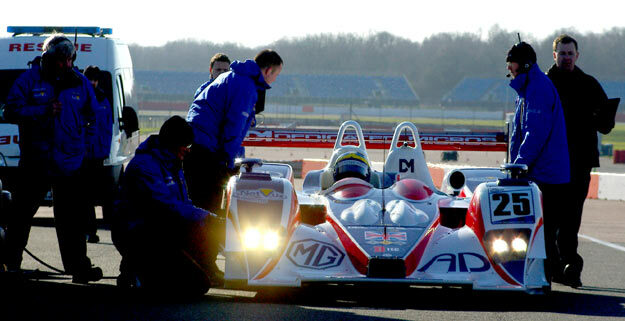 RML AD Group’s new MG Lola EX265 completed a faultless first shakedown test at the Silverstone circuit yesterday, Friday 8th February. The morning run left Brazilian driver Thomas Erdos thrilled by the responsiveness of the new XP-21 engine, and looking forward to the prospects of defending the LMP2 title in this season’s Le Mans Series. 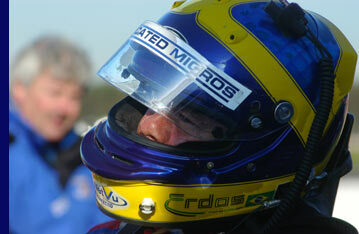 Thomas Erdos and co-driver Mike Newton took the series title last year with RML’s MG Lola EX264, having won the LMP2 class in the Le Mans 24 Hours in 2005 and 2006. Since then the EX264, itself a derivative of the EX257 that wowed the crowds at Le Mans as an MG works entry in 2001, has undergone significant further development. Arising from fresh links with Shanghai Automotive, MG’s new owners in China, the car has been re-homologated as the MG EX265. Most significant amongst those enhancements has been the production, in association with AER, of the two-litre turbocharged XP-21 engine. The EX265 was running in full race trim at Silverstone, including the additional 50 kilos that will ballast all the LMP2 entrants in the Le Mans Series this year. This extra weight, up to 825 kilos from 775, in conjunction with reduced fuel capacity (down to 80 litres from 90) is intended to emphasise the differences between the P1 and P2 prototypes. The flipside to this amendment to the regulations is likely to manifest itself in an even closer parity between LMP2 and GT1. In 2007 the GT class leaders were already as quick down the straights as the best in LMP2, so the added weight could further complicate this issue. The importance of developing a more powerful engine, and thereby hoping to reinstate some degree of advantage in this inter-class battle, becomes even more significant. “To have this new engine running so well, to exhibit such power in its first test, demonstrates a real step in the right direction,” said Erdos. 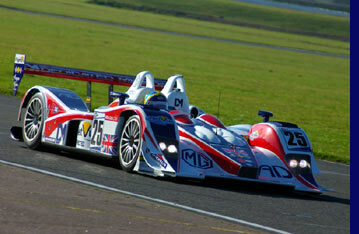 The team plans to complete another run in the MG Lola EX265 ahead of the first official Le Mans test at the Paul Ricard circuit in France at the beginning of March.